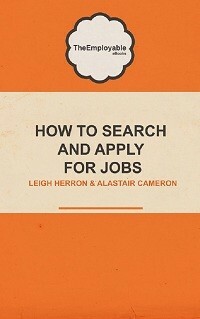 At TheEmployable we are not averse to highlighting the wackiest attempts at finding a new job. Often or not those attempts are a parody of a previous wacky attempt, be it a billboard ‘hire me’ advert, or a social media campaign. However we think that Philippe Dubost has struck gold with his wackiest job hunting promotion. It’s certainly up there with the best for sure and in terms of attention to detail, creativity and humour its debatably the best attempt we have seen for a long time. 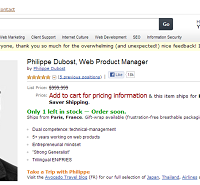 Philippe Dubost has created a fake Amazon Page of himself – a complete replica of an Amazon product page, complete with ‘add to cart’ and product detail – if you did nothing more than glance at this page, it is an Amazon product page in every possible way. Philippe is a Web Product Manager so it makes sense that the page looks so authentic. In terms of finding a new job, we are keen to find out if Philippe’s endeavours result in job creation. If nothing else this job-hunting technique (or clever marketing ploy) make Philippe stand out, and in that way, the job has nearly all but been done. We are not suggesting that you all go out and create fake Amazon, Facebook, or Ebay pages, however perhaps we all should be thinking about how innovative and creative we are being with our own job hunting and the techniques we are using or have used.